I guess I could say that I have a lot of experience with weaving warp-faced fabric on my backstrap loom. Years of practice have led to my having a certain consistent way of handling the weft, a certain amount of tension that I apply to the warp with my body and a certain beat (depending on the structure I am weaving). My weaving has settled. Therefore, I can use a sample I wove a year ago to give me the reliable information I need for a new project in terms of the number of ends I must measure in order to achieve a certain width. This wasn’t so when I first started backstrap weaving when I would find that my weaving had dramatically changed within the space of a few months and that I couldn’t rely on old samples to give me the information I needed. My notes had to be constantly upated. Sampling rep weave with various finishes for hemming before taking on the larger project. I don’t depend on a wraps-per-inch type of calculation to tell me the width I can expect from a new yarn. Certainly, it would give me an idea, but there’s no getting away from the need to sample. I can give an identical warp to eight weavers and each will weave a good warp-faced band of a different width to that woven by their companions. I can’t make a calculation for the yarn based on wraps-per-inch and then expect everyone’s band to turn out exactly the same. Some weavers have the warp threads rammed up tightly next to each other, others have them barely touching or with a hair’s width distance between. 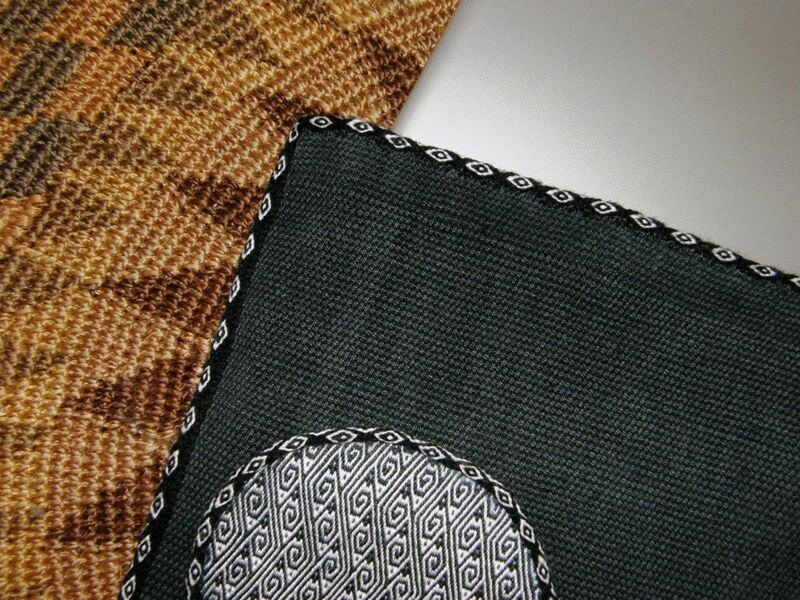 The weft will still be concealed and the resulting fabric will be warp-faced. The width achieved from one weaver to the next can vary considerably. I tend to weave at the more relaxed end of the scale with my warp threads barely touching. The new challenge I am facing now is how to keep that sett consistent across the entire width of the warp when doing plain weave with fine cotton thread. This is what I am dealing with in my latest project. One of the scarves I wove with cotton from Guatemala. The other day, I uncovered some Guatemalan cotton in a basin on the shelf. I had dyed it from yellow to red a long time ago hoping I would get a nice deep tone similar to the dark-ish red I usually use in my wall hangings. It came out bright and happy rather than deep and somber. Oh well. It ended up on the shelf where I forgot about it and found some other yarn to use for my wall hanging. After suddenly coming upon it, I see it with new eyes. Now I am in love with this shade of bright red and have decided to weave a square of cloth on which I can pose some of my small woven samples to show people.. It will make a nice bright splash of color on the table. I took measurements from two warp-faced scarves that I had woven with this same cotton some time ago and figured that 1472 ends would give me 40 cm, or about 15 3/4″. That width would sit well on my loom bars and I had several swords of just the right length for it. One version of the leaf pattern. If I wove this piece in un-patterned plain weave, I know that slight variations in the spacing of this fine thread would not be noticeable. If I had chosen to weave a single narrow column of supplementary-weft figures say, down the center, I doubt that spacing variations would have been an issue either. Of course, I had to make things difficult for myself by choosing to weave repeated supplementary-weft figures all the way across the bottom. And this is where the variations, at least to my eye as I sit at the loom focusing on picking up tiny threads, become obvious. I am weaving a leaf pattern which I now like to think of as one of my ”signature” ones and I can see the variation in leaf dimensions, ranging from robust to slender, across the width of the warp. Well, I suppose that is the way leaves come in Nature and I shouldn’t let it bother me too much! I had been aware of this potential problem from other supplementary-weft pieces I have woven with heavier thread and I did try my hardest to have all the threads spread evenly…dragging the point of my pick-up stick across the threads in attempt to have them settle in place as my teacher in Guatemala had done. I even unwove and started again when the leaves on the right were too narrow. I shall have to seek out a Master and try to capture the secret of getting all those very fine threads evenly distributed. I long for such an opportunity. What I have woven so far is the bottom border. Only the pattern of three leaves on the far right and left will continue in a column, waving to and fro, until I finish with a band of leaves across the top to match the bottom. In the space within this border of pattern, I plan to weave scattered leaves. It will be relatively easy going from here onward as I only have to pick up threads on the two edges. I LOVE sitting in a backstrap loom and using almost the full length of the loom bars. I love picking up those big swords and guiding them through the sheds. I love having to put a little ”oooomph” into opening sheds of fine sticky cotton and beating. I am having a really good time with this project! As for the ikat circles project that I wrote about in my last post…well, I have created a very unusual looking laptop slip cover with the resulting fabric. 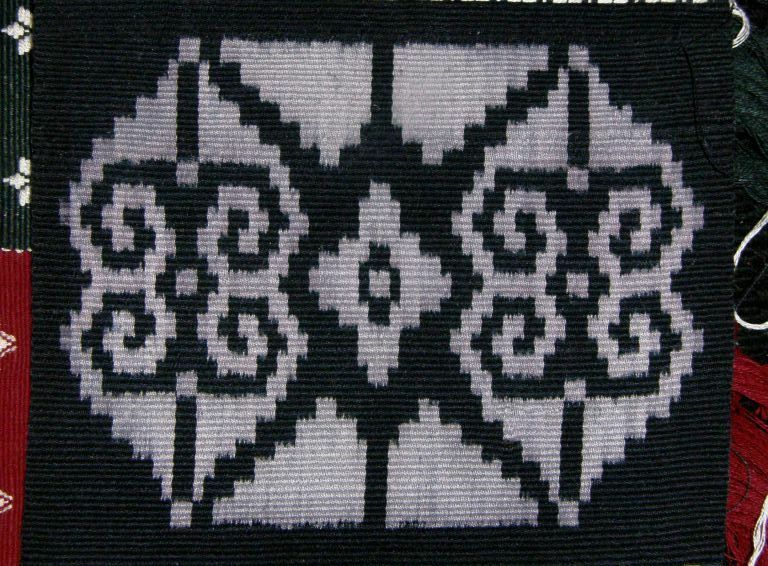 I have mentioned before the fact that when you do pick-up patterning within ikat shapes, you don’t get the delightful fuzzy outlines that are typical of ikat in plain weave. Because warp floats are involved, the outlines of the shapes are broken, disjointed and a little messy…not what I would call attractive. I got creative and decided to edge the shapes with tubular bands in order to cover the irregular outline. Ikat in plain weave. The motif I created has fuzzy, yet attractive, edges due to the shifting of the warp threads while the piece was being woven. This is the second circle. Once I had decided that I would use the tubular band edging, I planned a pattern for the second circle that would match the pattern on the ñawi awapa tubular band. I wish I had thought about that for the first circle as well. I had to fold the cloth through one of the circles so that it would fit the laptop….let’s call that ”quirky”. Yep, it’s a pretty quirky computer sleeve. I wove and sewed another ñawi awapa tubular band to the sides and around the opening. 1. 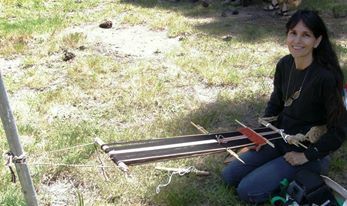 I need to create elongated shapes when I apply the ikat tape if I am going to use a warp-float structure. 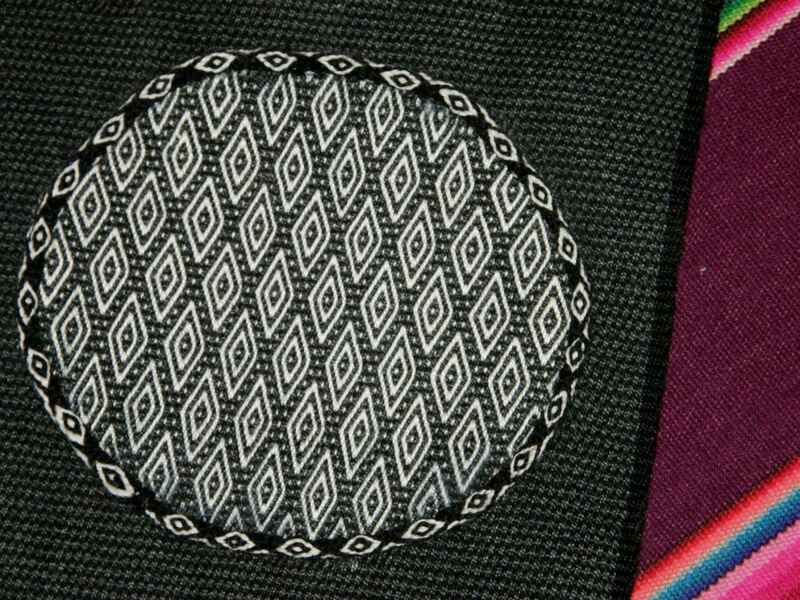 That way, the shapes will contract while weaving to take on the correct proportions. You can see that the woven circles have come out flattened. 2. I should put a bit more thought into the construction of the final product before applying the ikat tape if I seriously want to use the fabric for something in particular rather than just have it as a sample. That way, the ikat shapes will appear in the right place on the fabric. After all that black and white, let’s finish this post with a splash of color. 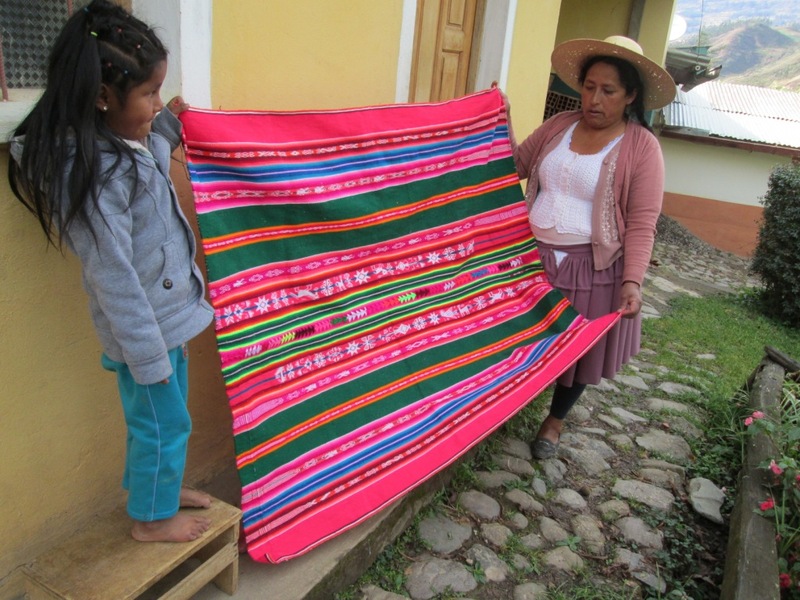 I have pictures, courtesy of Dorinda and PAZA Bolivia, of my weaving teacher Maxima’s new aguayo. I showed you the ch’uspa she was weaving for her husband, the new Mayor of Huancarani in a previous post. Unfortunately, Dorinda hasn’t shown the finished ch’uspa on the website. That piece was woven in plain weave with embedded columns of figures in double weave. 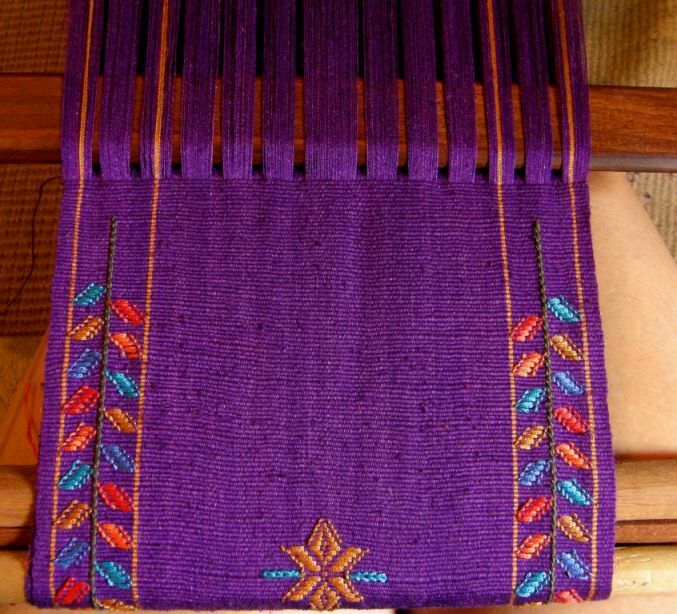 The aguayo has columns of double weave as well as pebble weave. 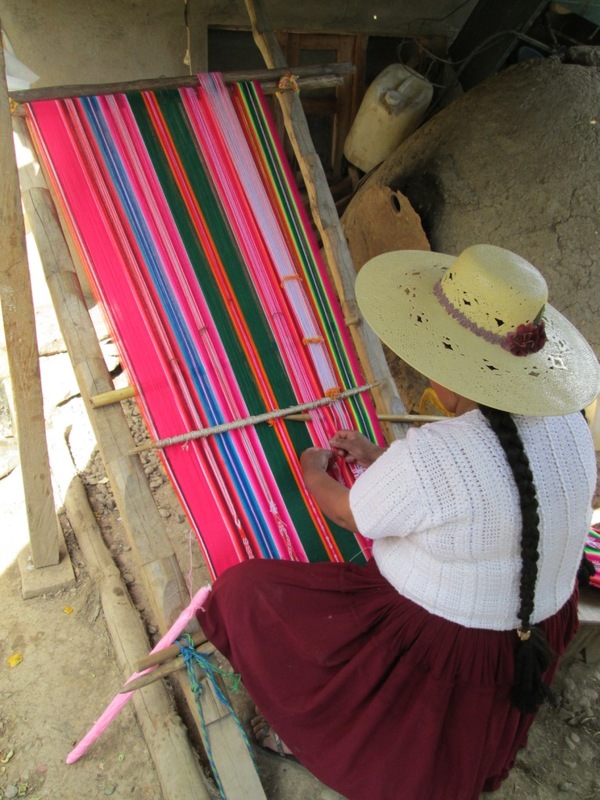 The aguayo is the large cloth which women drape over their shoulders and back and tie at their chest. It is used to wrap and carry their babies and any other bundle that needs to be transported. 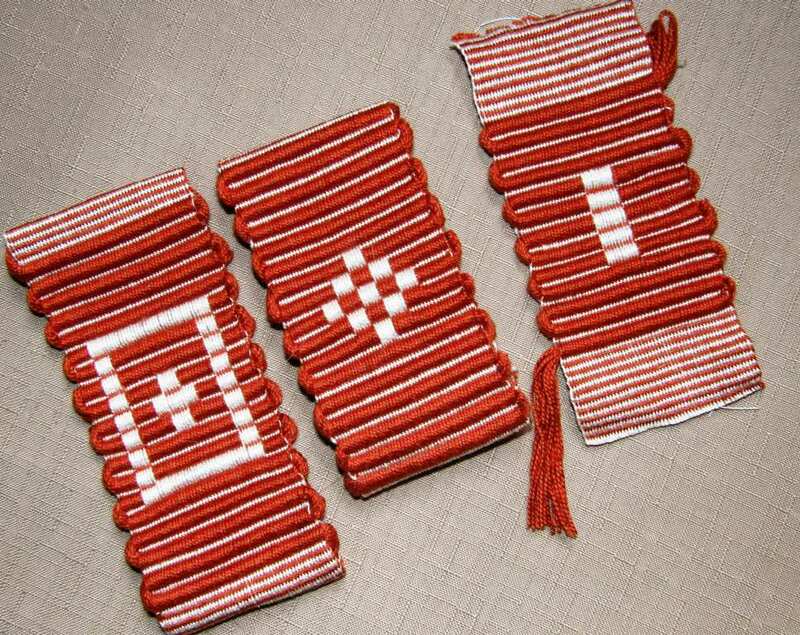 It is woven in two identical pieces which are usually joined together with decorative stitches. You can see the first finished piece on the ground next to Maxima while she busies herself with the second. 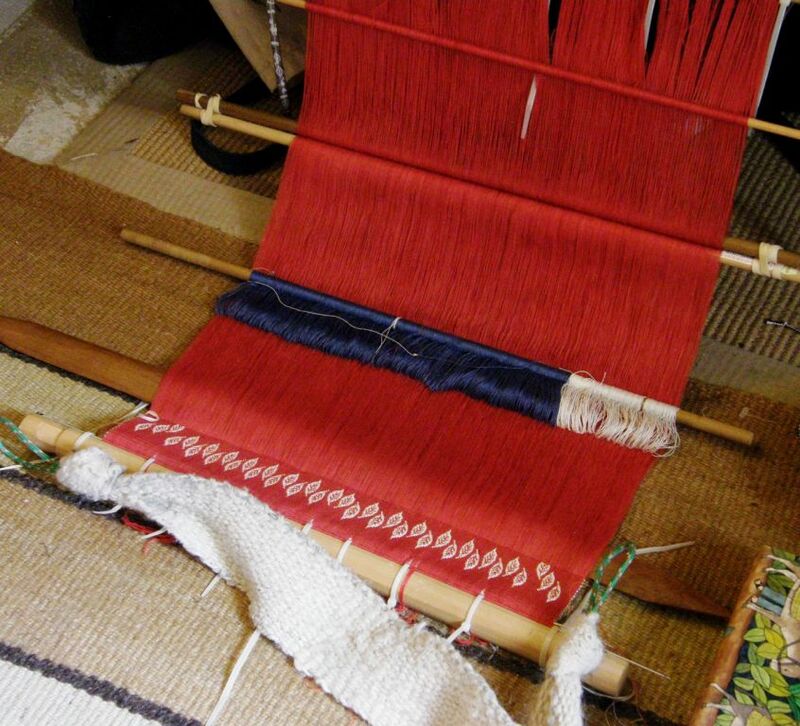 Dorinda writes on the PAZA blog that Maxima took 2 weeks to weave the first panel. 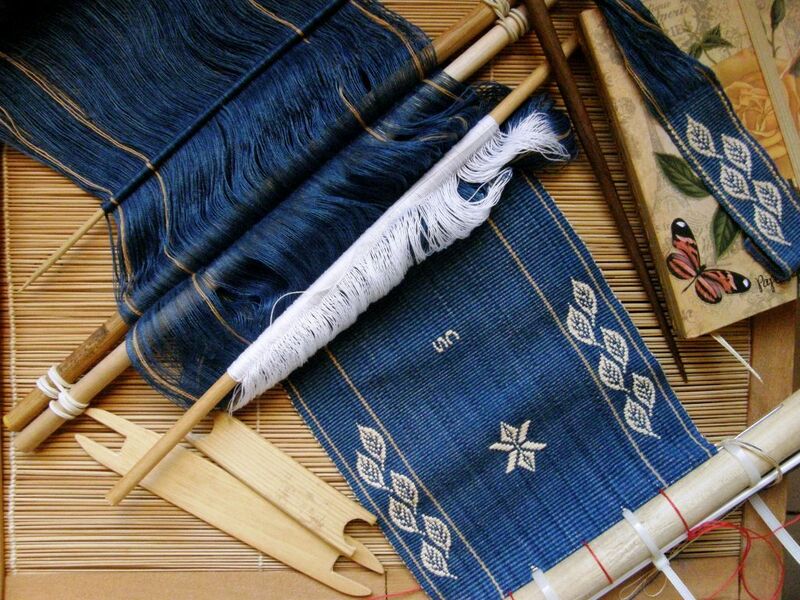 Before the weaving could begin, she had to use her drop spindle to add twist to the store-bought yarn to make it strong and smooth enough for warp-faced weaving. She commented that the cheerful colors made the naturally-dyed handspun wool that she has been using in the cooperative look dull and boring. Then she took a break from the high concentration required for the double weave pick-up and wove a plain-weave poncho in only four days. I can understand that need for a break! The weavers in this region of Bolivia use leaning vertical looms for large pieces. Narrow bands are typically woven on a body-tensioned loom sometimes using just an index finger and a toe as the warp beams! After the ”poncho break”, Maxima immediately warped up for the second aguayo panel. The two pieces have been joined with the colorful decorative stitches. It s not quite finished as Dorinda says that Maxima plans on adding a crocheted edging. 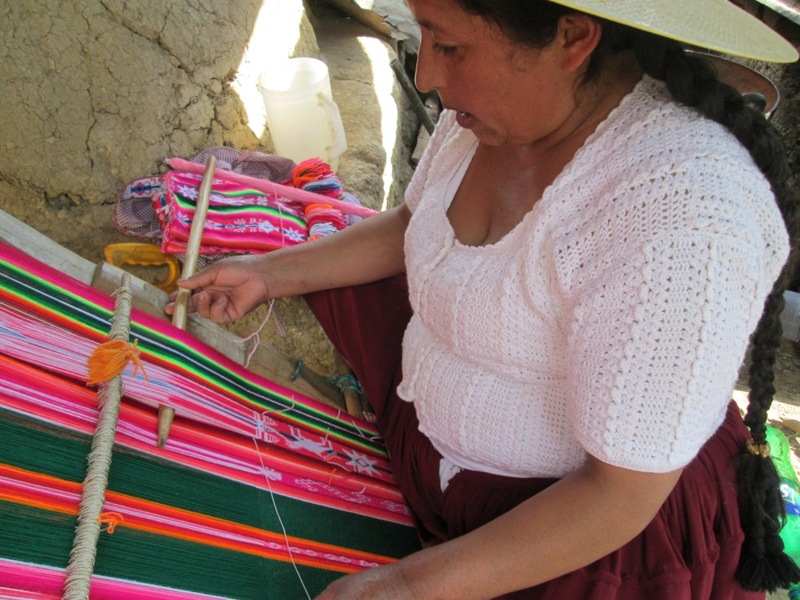 Please do visit the PAZA blog to read more about Maxima and the spinners and weavers of the Cochabamba region of Boliva. As I sit happily weaving what I hope will be a red square of a mere 16” x 16”, I have something to which I can aspire in Maxima’s incredible work. One day I would also like to weave two large identical panels and join them. New challenges. I somehow suspect that each one will take me longer than 2 weeks to complete. Beautiful laptop cover. I like the way the second circle drifts over the edge. Nice touch! Thank you, Barbara. That second drifting circle is growing on me! Beautiful, Laverne, as always you are such an inspiration! Thank you so much for all the information. I’ve been spinning for years and was branching out into weaving after I acquired a variety of interesting looms from an estate sale. Sadly, when I moved to Central America 3 years ago, I had to leave my spinning wheel and my looms behind. I hadn’t done much of anything but a little crocheting when a couple of months ago, a friend asked me if I could weave something in the shape of a leaf. I ended up rigging my warp off a chair using weights so I could adjust the warp as I went along. The result was successful, though not as neat as I would have liked. Then I decided I wanted to weave a belt, and that led me to your website. I managed to find some scrap wood and with some sawing and sanding was able to make a sword/beater and two different sized shuttles (I plan to make a smaller beater soon.) 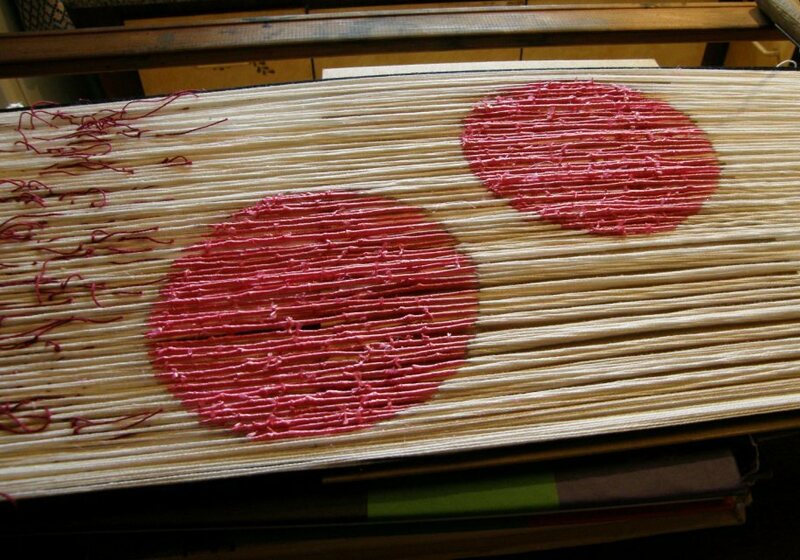 and was able to piece together a backstrap loom out of odd dowels I found. Today I finished my first project–my backstrap. It’s not perfect, but I’m so pleased with it. I’m hooked. A few more practice projects, and I’ll be able to make the belt. Again, thank you for all the wonderful information. I am looking forward reading and learning more. Thank you for your comment, Joy. Welcome to backstrap weaving. I hope you will tell me about you progress. 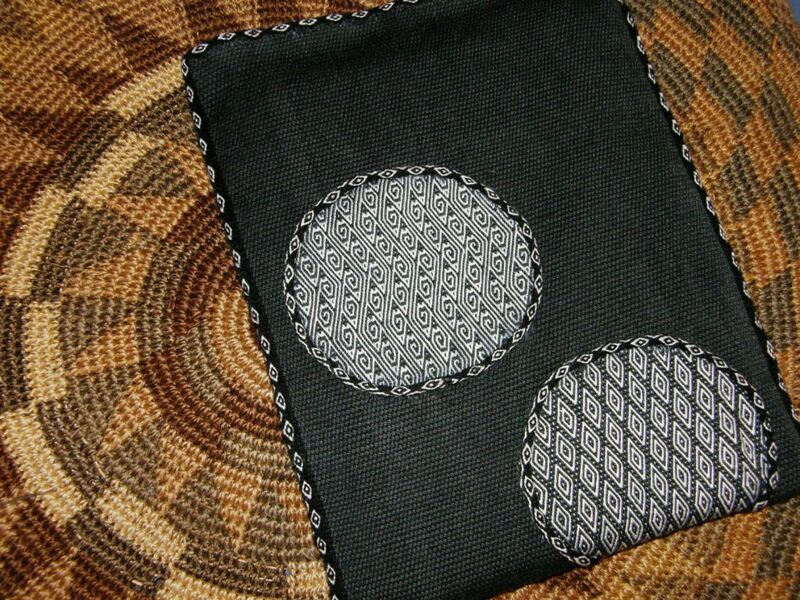 Edging the circle in your lap-top cover is a fabulous idea! Such constant innovation you have. The red leaf strewn cloth is gorgeous!